In this modern world of convenience, computers and smartphones, USPS mail seems terribly outdated. My own personal mailbox is a cluttered mess of junk mail, supermarket flyers and bills for those few companies that just can’t seem to figure out e-billing. The future was supposed to be filled with less paper, right? Clearly, I’m not the only person who wishes the postal service was a bit less ... analog. Outbox, a new tech startup out of San Francisco, wants to make your postal mailbox a little bit more like your e-mail inbox. How? For a $4.99 per month fee, Outbox will pick up your snail mail for you, create digital copies of all of it, and make it accessible and searchable online from your home computer or smartphone device. To get started with Outbox, you’ll need to give the company the physical address where your mail is sent and take photos of your mailbox and gate keys so copies can be made. Then, three times a week, an Outbox “unpostman” will pick up your mail and deliver it to a secure facility, where it will be opened and digitally scanned. If you get a piece of important correspondence – say, a hand-written thank you note from your mother – you can request Outbox deliver it in a package to your front door, along with any other mail you’d prefer to have a hard copy of. If you get junk mail – and let’s face it, most mail we get today is advertising – you can have Outbox “unsubscribe from Sender” to remove you from that particular bulk mailing list, similar to how the PaperKarma app works. All unwanted mail is shredded and recycled after 30 days. The benefits of Outbox are pretty obvious: You get to eliminate the clutter of paper from your life, putting all your important real-world correspondence in one universally accessible place. Bills are easy to find and bank statements are all in one place, allowing you to finally retire that rusty old filing cabinet you keep in the basement. Outbox could pay for itself in saved Tetanus shots alone! With a service like Outbox, privacy and security are large concerns – after all, you’re not just giving a stranger a copy of your keys, but permission to look through your mail as well. You’ll also need to be okay with dealing with significant delays in getting your mail. After all, getting a letter from New York to Los Angeles can take a week as it is even before Outbox tacks a few extra days onto the process. Still, if getting your correspondence in a timely fashion is that important to you, why are you even using USPS mail in the first place? For now, the company is only operating in San Francisco under a closed beta, but the early results for the service have been promising. Silicon Valley just backed the company with another $5 million in venture capital funding, which will allow Outbox to open the service up to all San Franciscans and further expand to another U.S. city later this year (likely New York City). If you’d like to learn more about the Outbox service – or sign up to try the service when it’s available to you – visit the company’s website at outboxmail.com. There’s an Evernote-affiliated service named Shoeboxed who does this already, and not only that, but Shoeboxed is closer to an outbox than Outbox. 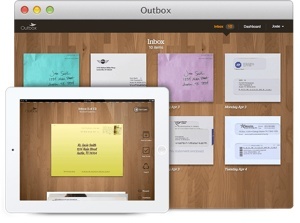 An outbox normally refers to a bin of papers from you destined FOR the inboxes of other people. With all the identity theft in this country, it’s hard for me to imagine folks getting on board with Outbox. At least with Shoeboxed, you’re forced to retrieve your snail mail yourself, then you mail them only what you want scanned in a postage-paid mailer.